We had some fun last week comparing two of our favorite characters (next year I WILL make a Lilly costume for Halloween). Anyway, I read Chrysanthemum to my class. 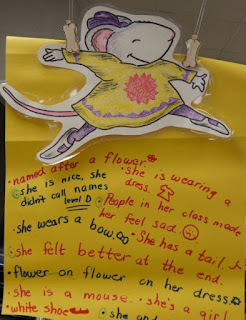 We brainstormed characteristics (with a little discussion of how she looked vs. how she acted or felt). We put these ideas on a chart. We hung up the chart with a picture I colored of Chrysanthemum (I was in the mood to color I guess). The next day we read Lilly’s Purple Plastic Purse. We talked about Lilly’s character. 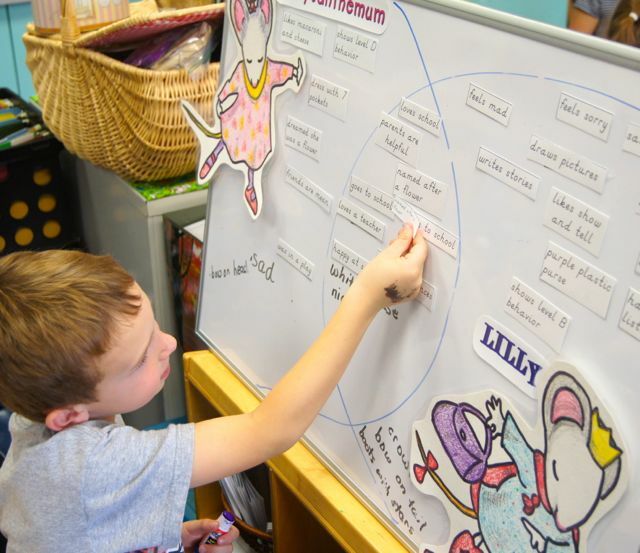 The books were in the reading corner for rereading and retelling. Meanwhile I typed up some descriptions of the characters - direct quotes and inferred characteristics. 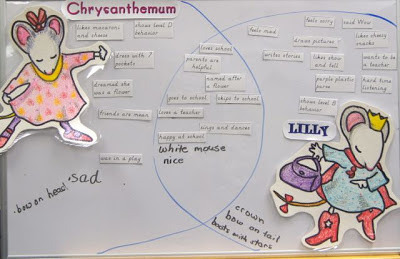 Later we read the “descriptions” together and put them on a big Venn diagram of Chrysanthemum and Lilly. I moved the diagram to sit near a table. At our “stations” the students had their own diagram and list of descriptors. The students could try and read the descriptions, read with a friend, or ask me for help as I was at that station - most of the time. 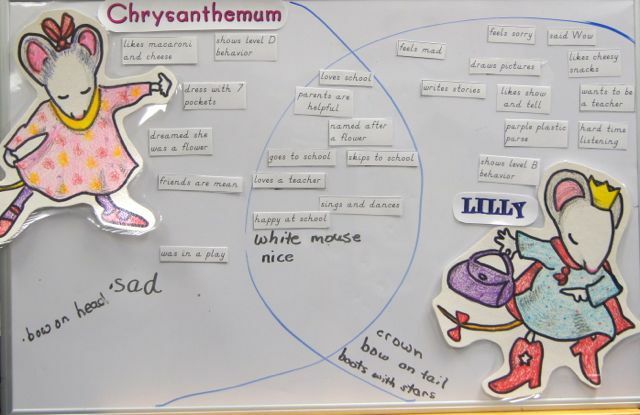 Kids could look at the books, check the big Venn or discuss with peers when making a decision where to put the descriptor (Lilly, Chrysanthemum or both). I was truly impressed at their memory and willingness to try and read the descriptions (we had read them all as a group previously so the kids were pretty confident). You'll have to color your own mice - but that's the fun teacher part.